It’s another week of Nintendo digital offerings, headlined by the charming (and so far pretty fun) 2D platformer Adventures of Pip on Wii U. 3DS gets Lord of Magna: Maiden Heaven from XSeed, and the Virtual Console on Wii U has one release this week with the SNES version of Pac-Attack. Splatoon owners get a new update this week as well, which includes N-Zap ’85 weapon and the Port Mackerel map. Check out the full list of digital offerings and deals below. 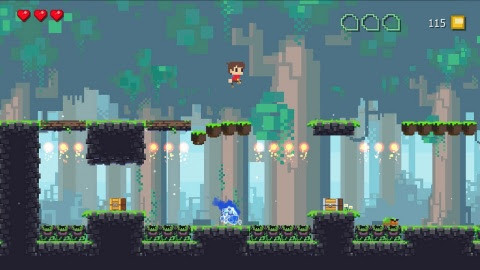 Adventures of Pip – Adventures of Piprevitalizes the classic side-scrolling action platform genre. Digital underdog Pip proves that you can’t judge a hero by his size. During the game, Pip gains the ability to grow by absorbing pixels from his fallen foes, but Pip learns bigger is not always better. Click here to view a trailer for the game. Lord of Magna: Maiden Heaven – Bowl over as many enemies as possible with a single strike in this new strategy RPG from the producer of Story of Seasonsand Rune Factory. The unique “bowling” battle mechanic requires lining up melee, ranged and magical attacks so frontline enemies are knocked into others for maximum collateral damage. Click here to view a trailer for the game. Turtle Tale on Wii U and Nintendo 3DS is 33 percent off (reduced from $2.99 to $1.99) until 8:59 a.m. PT onJune 18. Journey of a Special Average Balloon, Maze and The Letter from Eli Brewer are on sale until 8:59 a.m. PTon June 14. WAKEDAS, Witch & Hero and World Conqueror 3D from Circle Entertainment are on sale until 8:59 a.m. PTJune 25. Talking Phrasebook – 7 Languages is 40 percent off (reduced $4.99 from to $2.99) until 8:59 a.m. PT onJune 11. Banana Bliss: Jungle Puzzles, Cube Tactics and more games from Teyon are on sale until 8:59 a.m. PT onJuly 2. Bird Mania 3D has been reduced to $0.99 (from $1.99).